TRUE PATH daily planner, journal is now available on Amazon. 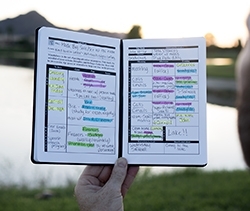 Scottsdale, AZ, February 15, 2018 --(PR.com)-- TRUE PATH, a company who produces personal development and productivity tools has made their flagship product TRUE PATH: A 13-week goal setting guide that gives you Direction, Structure and Accountability in the form of a daily planner available on Amazon. TRUE PATH which was launched in December after a successful Kickstarter campaign can now help improve your life through the development of healthy habits, changing unwanted ones and accomplishing the things you want most in life (Goals). Casey Moran, an entrepreneur turned Life Coach is giving away the secret to his success, the True Path goal planner. “Once all the Planners were in hand, Amazon was the next big step,” Moran said. The goal is to create a TRUE PATH culture with the Planner being the center piece and the community helping one another along the way. About TRUE PATH: www.truepathplanner.com is a personal development company based in Scottsdale, AZ. Founded in 2017, TRUE PATH has released its flagship product the TRUE PATH Planner.